CALAIS MUSLIM SETTLER JUNGLE READY TO BLOW……. – The Tundra Tabloids……. 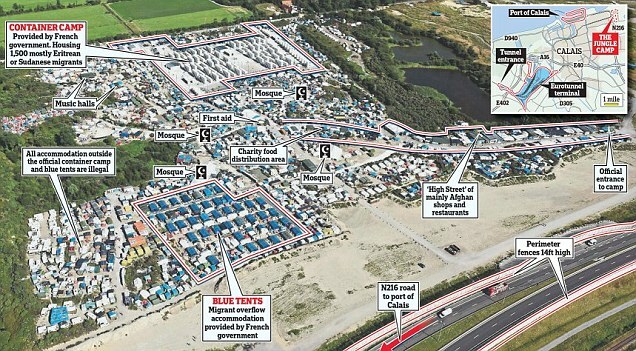 CALAIS MUSLIM SETTLER JUNGLE READY TO BLOW……. And the French ruling elite want the Brits to just ”open up their arms” and allow them in….. The men, in their early 20s, were part of a larger group confronted by Sudanese migrants in The Jungle camp. They are in a serious condition in hospital, one with a wound to an artery in his neck. Witnesses said fight was over positions the gangs occupy at the roadside during nightly attempts to leap on to lorries heading to Britain. There are tensions between nationalities and aid workers say camp is a ‘pressure cooker waiting to blow’. Previous Post Previous Post CLAIM: IRAN IN SYRIA RUNNING COVERT WAR COSTING BILLIONS…….